HAPPY NEW YEAR! HAPPY BIRTHDAY HORSES!! and all the best for 2013! It’s the CHINESE YEAR OF THE SNAKE – yours truly’s year!! 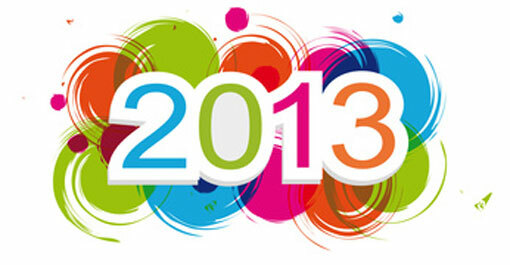 WHAT WAS YOUR FAVOURITE MOMENT OF 2012? From FRANKEL to BLACK CAVIAR to CAMELOT to I’LL HAVE ANOTHER to WISE DAN – these were the big names in horse racing outside of Canada this past year. ‘down under’, she was the iron mare in sprints. Don’t forget RAPID REDUX, who set a record for 22 straight wins by a North American horse and then was retired. The gritty claiming horse was a fann favourite worldwide. The Malibu Moon colt, soon to be 4, last raced in November when he won the Delta Mile and he had a workout in Ocala on Dec. 24. Since he did not race 3 times in Canada, he was not eligible for a Sovereign award but he certainly would have been a contender for Horse of the Year. Grade 3 Selene at Woodbine before bombing in the Woodbine Oaks at 4 to 5. She bounced back with a super 3rd in the Queen’s Plate and then hit her peak with a win in the Prince of Wales at Fort Erie over the boys. She is a millionaire now and is a contender for champion 3yo filly. and most will likely be torn down but it was interesting to go into many of the barns and houses and see what was left behind. The vet clinics and offices still had lots of books and some trophies, health records of great horses and other items. My favourite photo was of the feed cart, full of feed, poised outside an open stall door, appearing as if people up and left when the farm was vacated. The property is owned by a group including the Durham College. The gravesites outside the stallion barn have been kept up and the stallion barn has been cleaned up and restored so perhaps we will see an attraction/museum there one day soon. no longer exists for this year’s awards as all writing, newspaper, feature, web, are all lumped together. Kudos to newbies Janis Maine and Ericka Rusnak who were nominated for photos! Northern American Thoroughbred Horse Company and that pair were Sovereign Award winners. OH YES, NORTH AMERICAN WON 17 STAKES RACES THIS YEAR! California and then got the mount on the top colt. Meanwhile, in Ontario, the 3yo set was all a mess once Stronach Stables’ RIVER RUSH upset the Plate Trial with a stunning rally as a maiden. score. It was Danny Vella’s 2nd Plate win as a trainer. 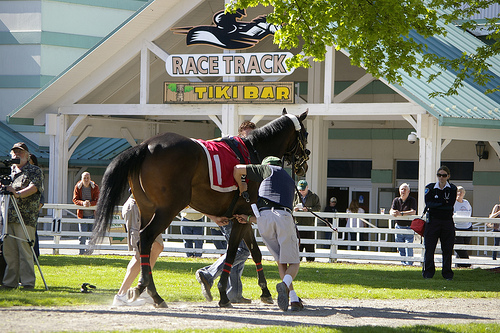 The colt was later injured and did not race again. THOROUGHBLOG, along with hundreds and hundreds of press people from all over the world, travelled to Belmont Park for the 3rd jewel of the Triple Crown in early June. I’ll Have Another looked like he was on the verge of winning the series and the excitement was almost unbearable. I’LL HAVE ANOTHER put racing on the front pages of the papers everywhere, gave some life to our great sport. It is hard to forget the moment I walked into the press office the morning before the big race, however, and saw long faces. The colt was about to be scratched having injured himself. Before long, he was off to Japan. that at times, it did not look like he would live. Now the colt is headed back to training. nicely for Robert Evans and trainer Mark Frostad and was 2nd in the Plate. After a flop in the ‘Wales, she took the Breeders’ for her 3rd win of the year. 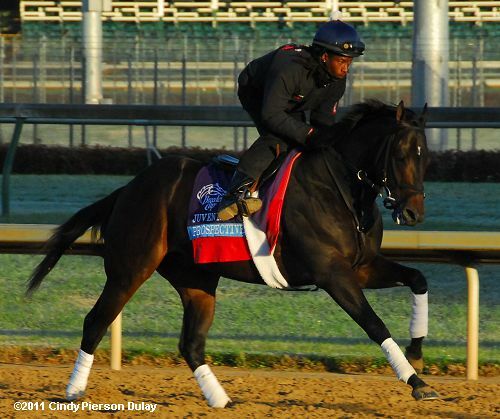 The Ghostzapper horse, owned by Stronach Stables and trained by Reade Baker is a top candidate for Horse of the Year. Speaking of the Woodbine Mile, it was super cool to get the top US horse WISE DAN to Toronto. He did not disappoint and later parlayed that score into a Breeders’ Cup Mile win. He could be the HORSE OF THE YEAR in the US. The Canadian International attracted a very International field and it was JOSHUA TREE and the personable Frankie Dettori that took the race. It was the 2nd win for the horse in the race and it was a feel-good story. SHELLEY BROWN won the trainer’s title at Assiniboia Downs to become the first woman to take that title . JULIE ROBILLARD did the same at Fort Erie, tying with ROSS ARMATA for the leading trainer title by wins. 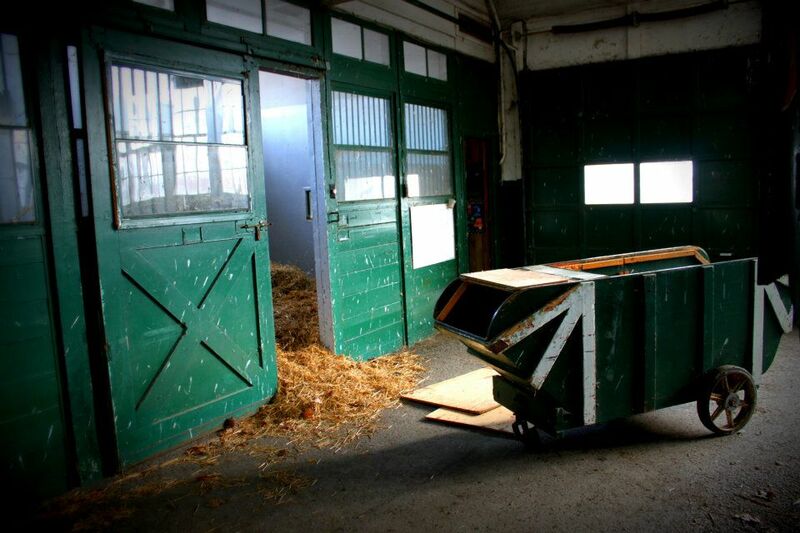 FORT ERIE.. what can you say, there have been groups that have banded together to save it but can it combat the latest disaster of slots being pulled? Dec. 31, 2012: Track scheduled to close. MARK CASSE (and John Oxley) – you could say it was an embarassment of riches for the Casse stable which unleashed one nice 2yo after another during the year. The fillies SPRING IN THE AIR (Grade 1) and SPRING VENTURE won graded stakes, the colts DYNAMIC SKY, STAR CONTENDER and UNCAPTURED were boss too. The latter won the Grade 2 Kentucky Jockey Club Stakes at Churchill Downs and will be the Canadian 2yo champion, perhaps HORSE OF THE YEAR in Canada. BILL GRAHAM – his WINDHAVEN bred stakes winners like UNCAPTURED, STAR CONTENDER and RIVER SEVEN, 3 of the best 2yos in the land. He also bred the unbeaten 2yo in Alberta, BOSCO. JOYFUL VICTORY was a top older mare in the US and his own winners included Henny Heart and Peyton. 3yo filly in Canada and was a nominee for a Sovereign Award. HUNTERS BAY, should get most of the votes for HORSE OF THE YEAR in Canada when Sovereign voting completes in just over a week. DANNY VELLA – won the Plate, had a strong season as did trainers READE BAKER, MIKE DOYLE and NICK GONZALEZ, and BARB MINSHALL just to name a few. ROXY GAP – this sprinting gal won 3 graded stakes races thi year – can’t say that about too many horses in any year, and she is a top contender for champion female sprinter. MAGIC BROOMSTICK – flew in for Sam-Son and Malcolm Pierce in the fall off a one year layoff, won 3 stakes at 2 different distances on 2 different surfaces. On the rider’s front – JESSE CAMPBELL, EMMA-JAYNE WILSON, EURICO SA SILVA and STEVE BAHEN had strong season behind leaders LUIS CONTRERAS and PATRICK HUSBANDS. There were so many more memorable racing days, trips and events that it would be hard to put them all down as we near 2013. 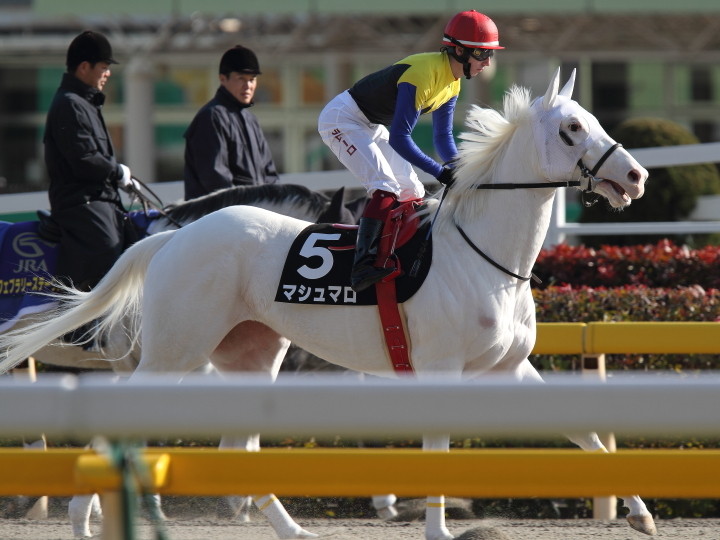 A favourite horse in Japan – MARSHMELLOW! It is business as usual for many Woodbine trainers south of the border as many have been quite busy not just with training but with racing. NICK GONZALEZ and his team won another race at Gulfstream, this time on Dec., 30 with the old timer SAFETY ZONE, who turns 9 today. This durable guy won for $25,000 claiming and was thankfully not claimed. He raced in the Barbados Gold Cup a few years ago! Repent is out of WAVERING GIRL (born in 1987) who was 23 when she foaled this guy. 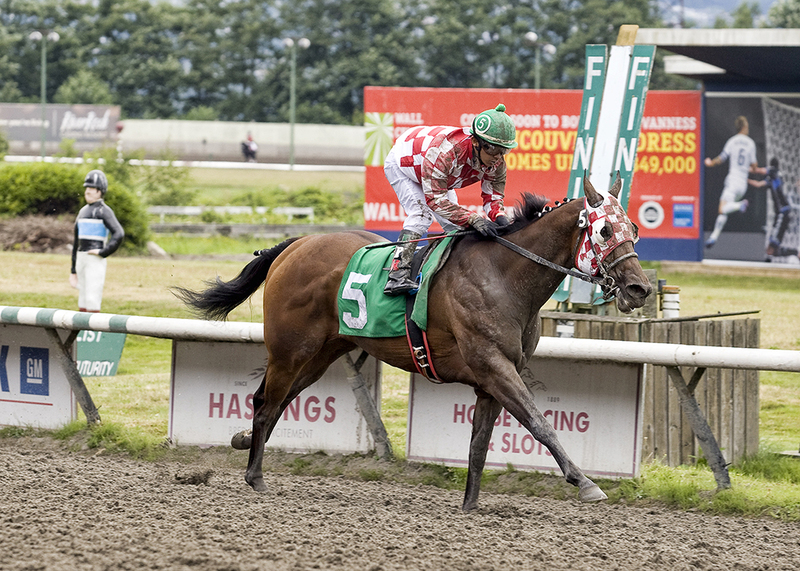 GLENCO KID won the ASCOT GRADUATION STAKES at Hastings Park in the fall. 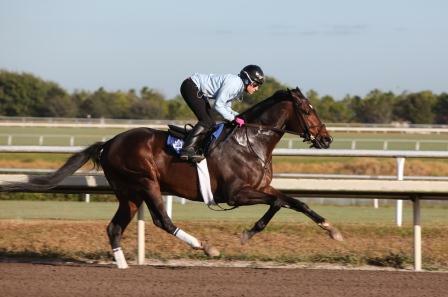 2yo, 6 1/2f, 1:16 4/5, ft.
Comp Inc; B-Woodford Thoroughbreds LLC (KY); T-Sandi Gann; J-Richard Harvey Hamel. $20,398. Lifetime Record: 6-3-0-0, $94,730. *1/2 to Military (Danzig), GISW, $462,716. 2–Hazardous, 119, g, 2, Candy Ride (Arg)–Malley Girl, by Malek (Chi). O-Vegas Racing Team LLC. $6,580. 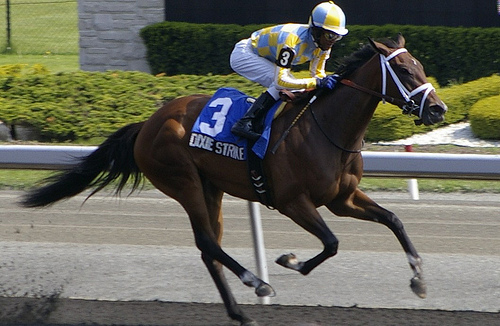 A potential agreement between the Canadian and Barbados governments could see more of this country’s top jockeys earning big bucks on the North American circuit. Canadian government had contacted him on the issue. “This is a wonderful opportunity for Barbados, and I am really hoping that everything can be arranged early in the new year,” an obviously excited Husbands revealed. Please read the full story in WEEKEND NATION, or in the eNATION edition. So Bajan jockeys will be able to ride in Canada, but the guild make it almost impossible for jockeys from anywhere else to ride here regularly? So if Alex Solis were Bajan he would have been able to ride for anyone in 2012? I agree with Fred…..why Barbados riders and not those from U.S., Mexico, etc. ?